The snow finally cleared at the end of last week, and for the first time this year I managed to cycle into work. For the most part the roads were grand - just the odd track of ice here and there. Myself and @oisinboydell had planned a long mountain bike spin in and around Kippure, but the snow was still pretty deep up there, so another cancelled spin. While its all nice having snow, it plays serious havoc with any routine / training plans. Still made use of Saturday building up the Pronghorn (more on that in another post). 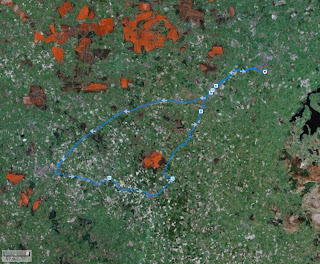 And on Sunday myself and Gene did a 3.5 hour road spin in the flatlands of Kildare and Laois, heading from Naas down to Portlaoise, across to Athy and back up to Naas. The weather was perfect and it was great to get a long, non-stop spin in. Monday I managed another spin into work. I had hoped to get the commute in 3 or 4 times a week, but I've been scuppered so far. With seriously limited time, the work commute will become a big part of my training, so I need to get the most out of that time, especially in the morning. So by getting up a little earlier (arrgh), I want to extend it a little by heading up and around Slade. It won't add a lot in distance wise, but I do get a nice hill to climb. Wednesday myself and Gene hit Glending for a nightspin. This was the first of the training spins. We started off easy with a spin around the trails, then ran a handicapped race. Its a great way to really push yourself - knowing you've someone in front of you or behind. 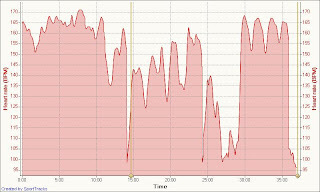 After that we did a few intervals on a short section of fireroad. All in all it was probably only 40 mins of effort (minus warm ups) and the plan is to keep building on this over the next few weeks - longer 'races' and more intervals. Yesterday evening was an hour on the turbo trainer watching Flashforward on the tv. Nothing to write home about - just a long TT run. And today myself and @Oisinboydell hit Djouce for a hard n' fast 4 hours. It was good fun, lots of techie trails and hard climbing. Just whats needed this time of year. Oisin mentioned that the Chris Carmichael book 'The Time-crunched Cyclist: Fit, Fast and Powerful in 6 Hours a Week' might be worth a look. I doubt I've even got 6 hours a week, but will probably get it. Now if someone could come out with 'The Time-crunched Cyclist: Fit, Fast and Powerful in 3 Hours a Week' - then I'd be interested... coincidently, Dave also has reviewed this book.